When was the last time you truly felt the joy of being alive? Felt connected to the earth and her rhythms, or to yourself and your rhythms? By tuning into the seasons, we can foster and maintain a joyful, healthy balance, reducing the amount of disease, disharmony, and distress in our lives. Our ancestors used to live their lives according to the seasons, but nowadays we ignore that, following the same routine day in day out, even though the patterns of the seasons still underpin our daily lives. Synergy of the Seasons offers you simple solutions and steps to discovering joy through wellbeing. It’s a comprehensive, easy-to-follow manual, with information on the different seasons and common ailments, simple recipes, and advice on the best essential oils to care for your wellbeing simply, effectively, and naturally. I’ve worked with people in private practise as an Aromatherapist for ten years. In this time I’ve realised that people come to me with similar issues at key points of the seasons, it’s more than simply seasonal affective disorder, or sore throats in the winter. Our ancestors used to live according to the seasons, tuning in to the natural rhythms of the earth and adapting their lives accordingly. Yet we choose to ignore that. Doing the same things day in day out, year in year out. I believe we’re paying the price. The energy of the seasons underpins our modern lifestyles whether we choose to acknowledge that or not. When we choose to tune in to that energy, to recognise how that can affect us then we are able to integrate steps in to our lives that allow a greater sense of ease, harmony and balance. When we choose to ignore that and keep on keeping on, then patterns of dis-ease, dis-harmony and distress can manifest. “Synergy of the Seasons,” is a book seasonal health and well being. 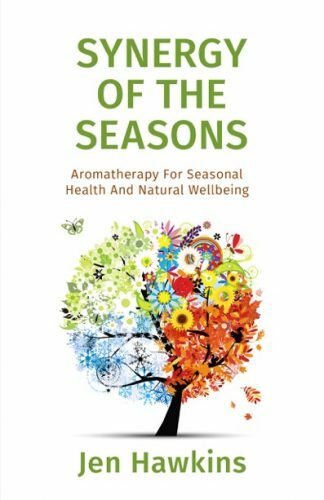 There’s a section about the seasons and how they underpin our lives. There’s a section on common ailments, how they can be prevalent at certain times of the year and advice on how to manage these. There’s a comprehensive section that looks at 24 essential oils and their beneficial properties. There’s a section full of recipes, blends, tips and advice on how we can all use the oils at home to care for our health and wellbeing simply, effectively and naturally.